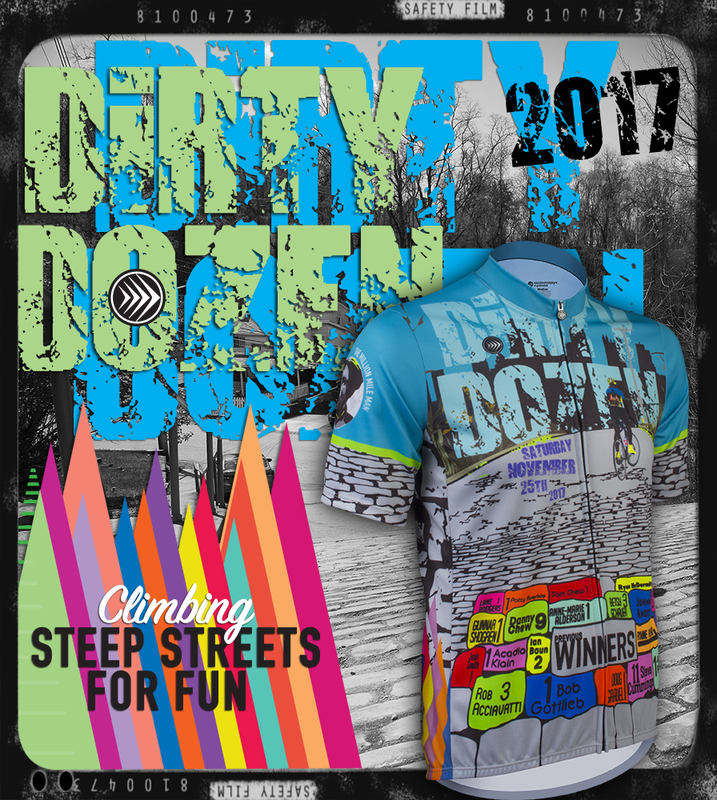 Aero Tech Designs 2017 Dirty Dozen Cycling Jersey - Steep Streets For Fun! - Support Danny Chew! This year's Dirty Dozen is just around the corner (November 25th) and with it, Pittsburgh native Danny Chew! 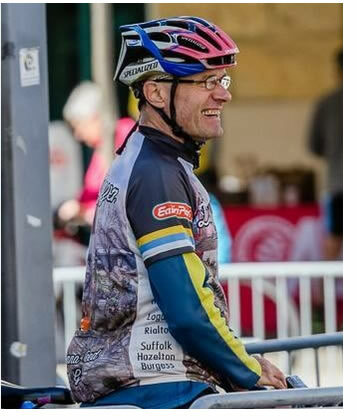 The Million Mile Man himself will be returning to the Dirty Dozen race he helped create, a year after a cycling accident left him paralyzed from the chest down. But that hasn't stopped Danny Chew from finishing his goal of biking one million miles. Through rehabilitation and training with his new handcycle, he is now around 784,000 miles! At this year's Dirty Dozen, Danny Chew plans to be cheering on cyclists in his handcycle atop Canton Ave., Pittsburgh's steepest hill. Pittsburgh native Danny Chew wants to bike one million miles in his lifetime. To challenge himself, he crammed 13 of Pittsburgh's toughest hills into one continuous ride, creating the first Dirty Dozen in 1983. In the 33 years he has organized the event, Danny Chew set several Dirty Dozen records, one of which includes biking the current steepest hill in the U.S. (Canton Avenue) 66 times. Show your support for Danny Chew and all these tough cyclists with this year's Dirty Dozen cycling jersey! Designed, printed, and manufactured in our Pittsburgh-based factory, this short sleeve jersey is Pittsburgh tough to withstand the steep and winding streets of our city. With this performance enhanced jersey, you'll be able to ride longer and feel stronger to fully climb those hills and make Danny Chew proud! Proudly made in our Pittsburgh-based factory, this cycling jersey is made with 100% AeroDri polyester, a soft yet rugged fabric that will keep you dry and cool while cycling around town and climbing those steep hills. AeroDri is a wearable tech fabric that manages moisture away from the skin and through the clothing for evaporation. Moisture management is one of the key performance criteria in today's apparel. Moisture management is the process of transporting moisture away from the skin to the garments outer surface. Moisture management often refers to the transport of both moisture vapor and liquid away from the body. When wearing a garment manufactured with AeroDri, the moisture vapor can pass through openings between filters of yarns. Moisture management with AeroDri leads to temperature control and enhanced comfort. Microfibers are key to the construction of AeroDri fabrics because of the fine fiber size and the knitted construction which contains small gaps and big surface areas for evaporation of moisture. The sprint cut fit is snug so the jersey won't ride up or flap around while cycling up, down and around the Dirty Dozen course, but still offers flexibility and stretch. It also features a full zipper front for easy removal and layering, while giving the illusion of being invisible as it blends into the breathable AeroDri fabric. It also features a large Aero Tech Designs zipper pull tab that is easy to use with one hand. Great when you're climbing those steep streets! On the back of the bike jersey are three easy-to-reach pockets with an elastic top to keep all your gels and other items safe while cycling on the hills. Underneath, there is a reflective tab to help increase cyclist visibility during night rides or low light scenarios. The sublimated jersey print is inspired by the Dirty Dozen race course. The design features a cyclist in riding up a gray cobblestone road that appears partially paved, focusing on the Pittsburgh skyline ahead. The cyclist is wearing last year's Dirty Dozen jersey, featuring the narrow triangles depicting each hills elevation, as well as some Aero Tech Designs yellow shoe covers. At the bottom in a cobblestone pattern are previous Dirty Dozen winners, along with the quantity of rides won. The right sleeve of the jersey features a face badge of the Million Mile Man himself, while the left sleeve features our cog seal that states Proudly Made In Pittsburgh. Because our jersey is sublimation printed in our own Pittsburgh-based factory, these colors will not fade! So you can wear this Dirty Dozen jersey for many more bike rides to come! Please support Danny Chew and The Dirty Dozen bike race on November 25, 2017. 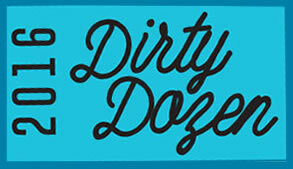 You can check out Danny's Dirty Dozen Bike Race website for details. In 1983, Dan & Tom Chew and Bob Gottlieb wanted to showcase Pittsburgh's steepest and toughest hills in one ride, never getting more than 10 kilometers away from the center of the city. We searched out hills on Unites States Geological Survey (USGS) maps by counting the 20 foot contour lines/intervals. The closer the lines, the steeper the hill. Sometimes the "road" was merely steps for pedestrian traffic only. So on Saturday December 17, 1983, the first Dirty Dozen ride was held in 27 degrees F with snow flurries. Among the 5 starters were Oscar Rattenberg and Ron Reider, but only Dan, Tom, and Bob finished. Dan & Tom were deemed the two strongmen of the ride. The 5 place points system was first used in 1988 when 13 starters showed up. The 10 place points system was used in 2007 when 131 riders started, in 2008 for women, and in 2011 for men. When Tom Chew moved away from Pittsburgh in 1985, Dan Chew took over as the ride organizer. Back in the early years (the 80's) a macho attitude prevented any rider from using gears lower than a 42x24. In recent years, the ride has gotten easier due to lower gearing and several of the hills being paved (asphalted) which used to be rough cobblestone or wavy blacktop killing what little momentum the rider had. In recent years, riders have used a 39x32 gear which makes the ride much less taxing on the rider's upper body. 3. Berryhill Rd. between Saxonburg Blvd. and Middle Rd. Great color and style. Received great compliments.